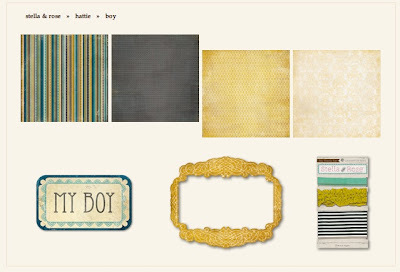 For years, My Mind's Eye has created beautiful collections of papers, embellishments, paper frames and sentiment cards. Over the years these collections have been styled with a vintage yet modern appeal. The latest group of designs created by Jen Allyson for My Mind's Eye is no exception. Stella and Rose is made up of smaller groups of papers and embellishments featuring eclectic girls names: Gertie, Hazel, Mabel and Hattie. I had the luxury of having a playdate with Hattie and I enjoyed every minute of it! The Hattie group breaks down even further into five ensembles: Happy, Family, Remember, Buddies and Boy. Each collection group is made up of two double sided pattern papers featuring four coordinating designs. Some of the pattern papers are die cut with decorative edges. 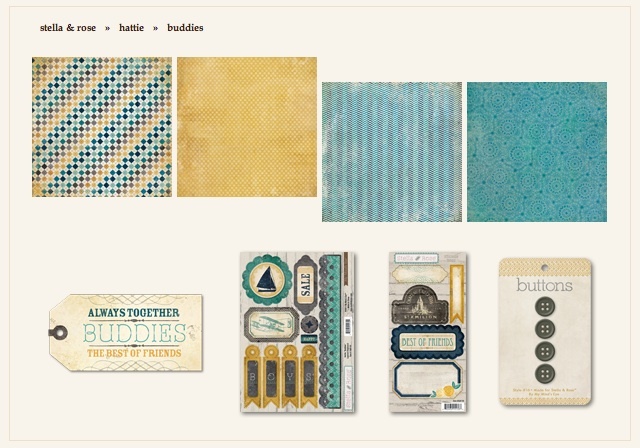 These papers feature a textured design and the paper is more of a cardstock weight. The sticker embellishments are designed on the same weight paper and are made with a nice sticky adhesive. 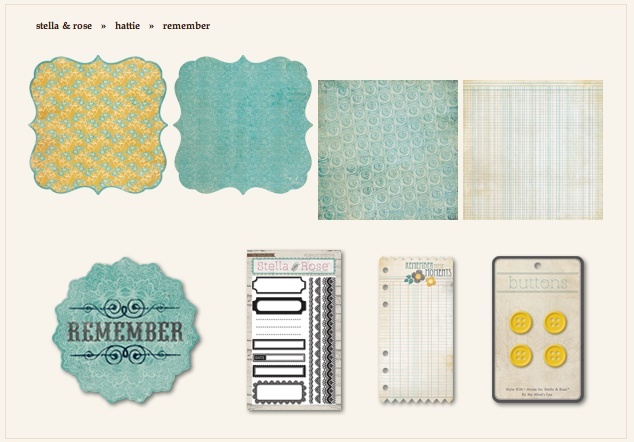 The clear stamps are a nice addition to the group and can work their way easily into a project featuring these designs. These papers, embellishments and stamps were a pleasure to work with and I look forward to having 'playdates' with the other girls in the Stella and Rose collection! -Even though the "Hattie" collection is broken up into 5 different ensembles, each ensemble coordinates and matches BEAUTIFULLY. -Double sided papers = more bang for your buck! "So Happy To Have You" sticker with brad embellishment. The key is part of the brad embellishment. Once again, beautiful brads with chipboard shapes attached. The brads have long backs, making them wonderful to use on thicker cardboard or multiple layers of cardstock. The ribbon from the Boy line matches perfectly. The pattern paper is such high quality and weight that it is perfect for cards or journal covers. The clear stamps are WONDERFUL and produce crisp, sharp images! 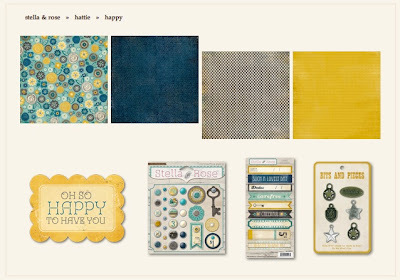 The embellishment stickers are 3-d and add the right dimension to this layout. What do you think? Leave a comment by midnight EST Thursday to win a MME prize pack!! Always love MME! Great project and layouts! Love this line!! I think the colors and embellishments are gorgeous! Thanks for the chance! I LOVE MME and this line is no exception...as the mother of a boy, I'm really excited about this color combo. It will be amazing with all my boys' pictures. This is really a beautiful collection! 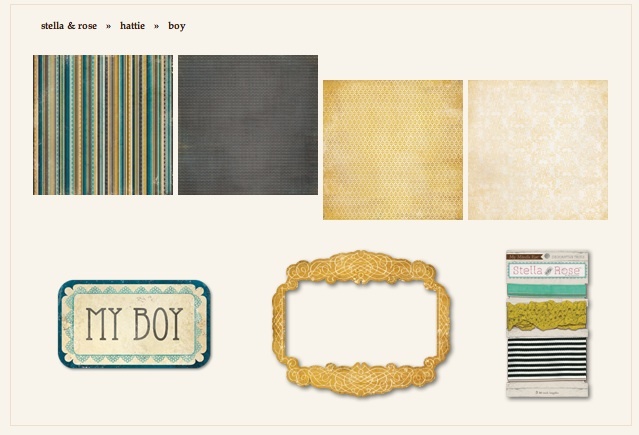 I really like it--it definitely would go with pictures of my boys! :-) Thanks for a chance to win! So funny that you mentioned the double-sided papers and not being able to decide . . . I usually have to buy two of a paper, just so I can have enough just in case I want to use both sides!! I think that My Mind's Eye's collection have really come a long way, and I love that they have trims and fun accents now. This is just a great collection, and I love what you created!! Beautiful projects! I love the Stella & Rose lines, and what you've done with them here. Beautiful collection - I love the "boy" colors! 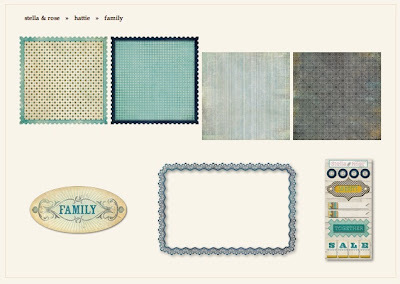 Your projects are a wonderful illustration of how versatile this collection can be. Thanks! Wicked, wicked cute!!! I love almost everything that MME puts out. I am always happy with their lines. I love the texture of their paper too and the weight. I'd never really used their details, but I got some lovely Hazel ribbon and other cute stuff, and well I'm in love!! What can I say? I would just JUMP for JOY if I got my hands on more of this line Stell & Rose! I'm really loving MME's dimensional embellishments with this line. They're so detailed and unique! Beautiful LO's! I Love MME-colors, embellishments all of it. oh I love MME. I have already purchased one of the diecut papers the family silk tie one and used it on a layout. I loved it and would love the rest of the collection! I love everything MME bring out - the colours in this collection are gorgeous! I really love this color combination. This looks like a great collection for my son's upcoming graduation! Love the project and would love to win a packet of goodies from MME. Love the Hattie collection!! Would love to win this collection (or any really) from MME - thanks for the chance! Love this release from My Mind's Eye. They did an amazing job this go round. LOVE!!! MME is awesome!! I love these colors and that it's great for boys! MME is always a favorite! Gorgeous lines - great for a scrapping a houseful of boys. This collection is amazing. Love the colors and I cant wait to get it!! wow, do I love pretty much everything MME puts out-- and this is no exception. I love that the colors in the Hattie colorway are "neutral" enough to use for any subject-- and yet they are still GORGEOUS! Love your layouts. The "home" sign is fantastic. Love the color combos in these papers. I've always loved MME! The colours of this collection are so perfect for boys, thus the clever name! Photos of my boys would look amazing on those gorgeous papers! When I have trouble adhering to textured surfaces, I go with foam dots or scor-tape! I love MME and how everything coordinates and all the different embellishments and... I could go on and on. I have loved all of MME's releases this time but the Hattie line has to be my favorite, the color combinations just speak to me. Love love love this collection! My favorite from CHA and I'd definitely enjoy playing with these! OHHHH! I just love love love MME! This line is SOOOOO LUSH!! LOVE LOVE LOVE these LOs! So fun-- that last one is my FAV!!!!! All of these creations are beautiful, with obviously great products, but the last layout is so AWESOME! The perspective from the photo helps, but it's the centered picture, surrounded by layers of repeating shapes ... and the off-set frame ... perfection! Honestly, it's a beautiful page with a slightly 3D feeling jumping out from the middle ... very cool! I seriously love MME, and especially the colors in this collection. Love the deep blue! I would love it if they made some alphasheets to go with the collections. I truly like this collection. The color scheme is fresh and works well for projects for my nephews. Love what you did with it! MME has really been making beautiful products/collections the past couple of years - this one is no exception. Love the colors - they could work for just about anything! Love the greys and yellows of this line. The blues, too, but that grey/yellow pairing really does it for me. My all-time favorite MME product is the 4x6 transparencies. If MME ever discontinues those, I will cry. 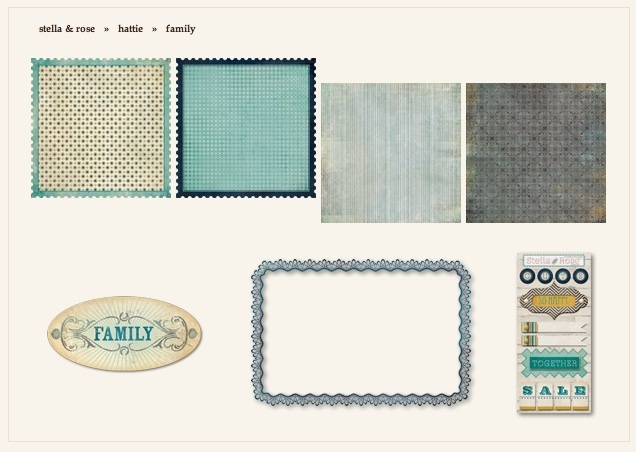 I absolutely love all the Stella & Rose papers and embellishments. They are vintagey and I love that - and I love doublesided paper so that is a plus in my book! And I love that they include coordinating stamps with some lines! This one is a must have for me with all the boys in my family. I love the simple timelessness of this collection.I could use it for years and it would still make fresh and interesting projects. How fun is your So Happy LO!!! Love all things MME! Love your projects. And I love the color combination in the Stella and Rose Hattie collection. I love this collection! great colors!! love the projects you made with it! The colors are just beautiful. You projects are great. Thanks for the chance to win. I want this line sooooo bad. The colours are absolutely gorgeous. Love what you created!!! WOW!!!! I will HAVE to own at least some of this paper! I see that it could be so versatile for many applications. I always have such a hard time finding CUTE papers that would work for masculine card/projects/pages, but I see that my search is now over!!! Thanks! You can't fault the quality of My Mind's Eye. I'm a regular purchaser. Wow! I absolutely loooove this line!! !